The trial of Azibaola Robert, a cousin to former President Goodluck Jonathan began Tuesday, June 28, 2016 with the Economic and Financial Crimes Commission, EFCC, presenting its first witness, Ibrahim Mahe who gave account of how he transferred $40million to ‘One Plus Holdings Nigeria Limited’, a company allegedly owned by Robert. Robert and his wife, Stella are standing trial on a 7-count charge before Justice Nnamdi O. Dimgba of the Federal High Court sitting in Maitama, Abuja for money laundering, criminal breach of trust and corruption. 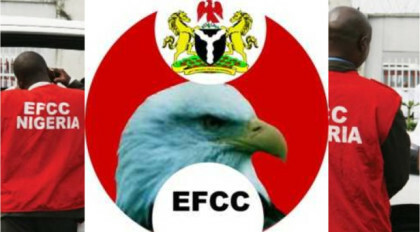 Mahe, a retired permanent secretary, special services in the Office of the Secretary to the Government of the Federation, while being led in evidence by counsel to EFCC, Sylvanus Tahir, told the court that, he did not know the first and second defendants (Robert and Stella), but got to know the third defendant, One Plus Company through a transaction. Narrating how he got to know the company, Mahe stated that, “on August 20, 2014, the National Security Adviser endorsed a memo to me which originated from the Office of the Director of Finance and Administration of the ONSA detailing the bank details of one company called ‘One Plus’ and the purpose for which the company was to be paid a sum of $40million (forty million US dollars). “The NSA instructed me to prepare payment and I prepared the payment mandate for the $40million in favour of ‘One Plus’ for the signature of the NSA. I sent it to the NSA, he signed and sent it to back to me and subsequent action was for me to counter-sign the mandate and then send it to the Central Bank of Nigeria for Payment”, Mahe said. The PW1 had earlier told the court that his responsibilities involved matters that had to do with the office of the NSA. He said that the Special Services Office responsibilities in relation with the Office of the NSA has to do with matters relating to finances of the entire “Intelligence Community” which included the Department of State Service, National Intelligence Agency and ONSA. According to him, permanent secretary, Special Security Office was responsible for co-ordination of the annual budget of the members of the Intelligence Community. “After formulating the budget, the Accountant General releases the funds of the ‘Intelligence Community’ through an account that is domiciled with the Special Security Office from where it is distributed to the various end users”, Mahe further stated. He told the court that his office served as a warehouse for funds of the ‘Intelligence Community’ and went further to explain how funds were utilised. “When funds get into the account, the NSA is informed of the arrival of the funds and proposal on the distribution to the various agencies is made to him. When he approves, the monies are sent to the end users”, said Mahe. The case has been adjourned to July 4 and 5, 2016 for continuation of trial.